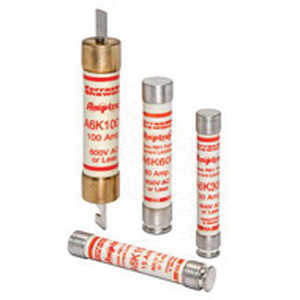 Mersen Amp-Trap® A6K-R Series Rejection current-limiting fast acting fuse is rated at 600-Volt AC/300-Volt DC and 300-Amps. Interrupt rating of this fuse is 200-Kilo-Amps at 600-Volt AC and 20-Kilo-Amp at 300-Volt DC. The class RK1 fuse of dimension 2-9/16-Inch Dia x 11-5/8-Inch, has cylindrical polyester body and tin-plated copper contacts. Low voltage fuse with blade terminal connection, supports clip mounting. It is suitable for load centers, panelboards, switchboards, bus duct, feeder circuits, non-inductive loads and lighting circuits. Fuse is UL listed and CSA certified.